Quince figuras matemáticas para recortar y pegar, de modo que se puedan construir las formas tridimensionales asociadas a su representación plana. Cuadernillo especialmente indicado para que niñ@s y alumnos puedan trabajar con las figuras en tres dimensiones. Fifteen mathematical figures to cut and paste, so that they can build three-dimensional shapes associated with their flat representation. 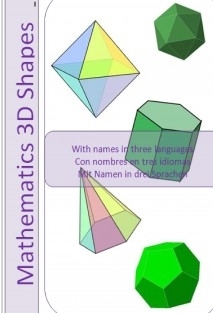 Booklet suited for childs and students can work with figures in three dimensions. Fünfzehn mathematische Figuren zum Ausschneiden und Einfügen, sodass sie dreidimensionale Formen mit ihren flachen Darstellung verbunden sind, können zu bauen. Booklet für Kinder und Studenten geeignet ist, kann mit Zahlen in drei Dimensionen zu arbeiten.